Today, Jesus surprises us by being merciful to those who resist Him and harsh with those who don’t. Why? St. Luke tells us that “when the days for Jesus’ being taken up were fulfilled, He resolutely determined to journey to Jerusalem.” Other translations use the phrase, “set His face,” to describe this determination, calling to mind how God told the prophets Jeremiah and Ezekiel to “set your face” against Jerusalem and preach its evils (see Jer 21:10; Ezek 21:2). Jesus was about to do the very same thing. The words, “being taken up,” describe His Ascension into heaven after completing the work God had given Him to do. This long journey into Jerusalem from Galilee provides the setting for the rest of St. Luke’s Gospel, in which he unfolds the “orderly account” he wants to give his readers of the life of Jesus (see Lk 1:1-4). We find that Jesus wanted to enter a Samaritan village, but when the people there found out that He was a Jew traveling to Jerusalem, they refused His visit. This infuriated James and John, who wanted to “call down fire from heaven to consume them.” They were likely thinking about Elijah, the prophet, who, centuries earlier, had called down fire on messengers from Samaria in a time of great covenant infidelity in Israel (see 2 Kings 1:9-14). Jesus “rebuked” them for this idea. Why was He merciful to people who refused to even allow Him to enter their village? Was it because they were acting out of their inherited prejudice against Jews, a tradition of hatred that had been handed down for generations? This kind of collective blindness is the sort of “invincible ignorance” about which the Church speaks in merciful tones, too (see Catechism of the Catholic Church, #1793). Later, in fact, many Samaritans responded to the Gospel of Jesus, as we know from the Book of Acts. The zeal for revenge in James and John (called by Jesus “sons of thunder,” with good reason), had Jesus allowed it, would have made this highly improbable. They journeyed on. Here, St. Luke tells us that men began to individually respond to Jesus. One says, “I will follow You wherever You go.” Surely this was what He was looking for. However, instead of telling him to join the group, Jesus gives him a warning: “Foxes have dens and birds of the sky have nests, but the Son of Man has nowhere to rest His head.” Why did Jesus sound so downbeat? Why did He emphasize the rootless life of His followers? Perhaps He saw in this man an eagerness that was more emotion than will. Jesus wanted him to count the cost of true discipleship (see Lk 14:28). “And to another, He said, ‘Follow Me.’ But he replied, ‘Lord, let me go first and bury my father.’” Here we see Jesus extending a direct call to a man whose first thought was his family responsibility. Burying a dead parent was an important, noble expression of honoring one’s parents. We would expect Jesus to make allowance for it, yet His response seems harsh: “Let the dead bury their dead. But you, go and proclaim the kingdom of God.’” We see here a touch of the Semitic hyperbole we frequently see in Jesus’ teaching (“hating” mother and father, cutting off an offending hand, plucking out an offending eye, etc.). Jesus is telling this man, whom He desires as His disciple, that as sacred a duty as burying a dead parent is, the need to respond to His call takes priority. “The dead,” or those who are not going to be disciples, the spiritually dead, can bury the physically dead. A true disciple must be willing to leave everyone, even his father’s home, as Jesus Himself did, to do God’s work in the world. Finally, another said, “I will follow You, Lord, but first let me say farewell to my family at home.” This request brings to mind an episode in our First Reading today, when the prophet, Elijah, called young Elisha to be his disciple. He requested permission to say good-bye to his family, too; Elijah granted it. Surely the Jews familiar with this Old Testament story would have been surprised at the severity of Jesus’ response: “No one who sets a hand to the plow and looks to what was left behind is fit for the kingdom of God.” Instead of accommodation, the man gets a warning from Jesus. Why? We must remember that Jesus could read men’s hearts. Did He see something more than mere familial sentiment in this man’s request to say farewell to his family? Did He see a reason to warn the man against inordinate attachment to anyone or anything that might distract him from his need to follow Jesus wholeheartedly? These responses from Jesus to men who seemed to desire to follow Him can surprise us if we forget what St. Luke told us in last Sunday’s Gospel. There, Jesus said that everyone who intends to follow Him must deny himself and daily take up his cross to fulfill that desire. The call to discipleship is radical. We cannot respond to it only out of emotion. It will cost us everything, just as it did Jesus. To “follow” Jesus means exactly that. Possible response: Lord Jesus, I must admit the call to follow You unreservedly in this Gospel makes me uncomfortable. Maybe I am too prone to making excuses. Please heal me. Here is the story of Elijah calling Elisha, in which we seen how leniency was given to Elisha’s request to bid farewell to his family before departing for good to be Elijah’s disciple and, eventually, successor. We also have an opportunity to see that Elisha did not use this desire for farewell as an excuse to delay his response to Elijah’s call. He made a meal of the oxen he had used for plowing—a definitive break with his previous vocation if ever there was one! Perhaps this seriousness in Elisha to obey Elijah’s call was what earned him the permission to take leave of his family. There was no chance that in saying good-bye, he would begin to have doubts about leaving. In our Gospel, did Jesus see something different in the man who asked the same favor? Is that why He had to warn him not to “look back”? 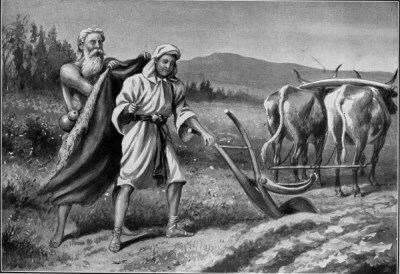 Elisha, in his immediate slaughtering of his oxen for the farewell feast he made for his family, showed himself already looking forward to his new life. No looking back for him. Possible response: Lord, help me not to look back to what might have been once I’ve decided it’s Your will to let it go. St. Paul gives us some helpful pastoral direction that touches on our Gospel message. First, he reminds us that when we resolve to put Jesus first in our lives, we are also resolving to put our neighbors first, too. See how he says that “the whole law is fulfilled in one statement, namely, ‘You shall love your neighbor as yourself.” In his epistle to the Galatians, St. Paul teaches about salvation that comes through faith in what Jesus has done for us and not through works of the law. In other words, we cannot make ourselves good enough for God to save us. Jesus came to do that for us. Now, however, although we don’t work our way into heaven, we do work hard at living our faith, because faith without works is dead (see James 2:26). One of the clearest ways we can express our love for God and all He has done for us is to love our neighbor. So, if we find a desire in our hearts to follow Jesus wherever He leads, we can count on Him to lead us into loving those around us. Second, as we all know, it is hard to love our neighbors! St. Paul explains why: “The flesh has desires against the Spirit, and the Spirit against the flesh; these are opposed to each other.” Anyone who seriously desires to follow Jesus will find this battle raging inside nearly all the time. It is only with the help of the Holy Spirit that we can live the life to which Jesus calls us. We should never expect it to be easy, as both Jesus and St. Paul tell us today. Yet we should not miss the encouragement we have because, as St. Paul assures us, if we live by the Spirit, we “will certainly not gratify the desire of the flesh.” Hope! Possible response: Holy Spirit, thank You for making the life of love possible to a sinner like me.